”...Some people turn on the television, but I stare at screens all day, so when I come home, I just sit and look at a piece of art. I find that very pleasurable”. Andrew Hall is a tall and personable man, a Brit who has been living in the United States for many years now. He is, however, nothing like your stereotypical ‘Englishman in New York’, somewhat lost in the global realities of today. An Oxford graduate with a degree in chemistry, Hall spent many years working for British Petroleum, later heading Phibro LLC, an active player in the oil market, and Astenbeck Capital Management. His reality is the fluctuation of oil and precious metal prices, market predictions and the game of staying ahead of the curve. Andrew Hall has long since made a personal fortune, part of which he has been investing in art. With his wife Christine, Andrew Hall founded a large and prestigious art institution known as the Hall Art Foundation back in 2007. 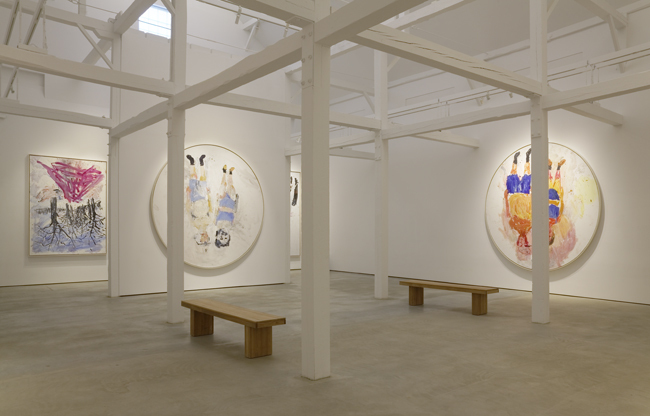 It was the couple’s extensive experience of owning – and co-existing with – art that informed their decision. 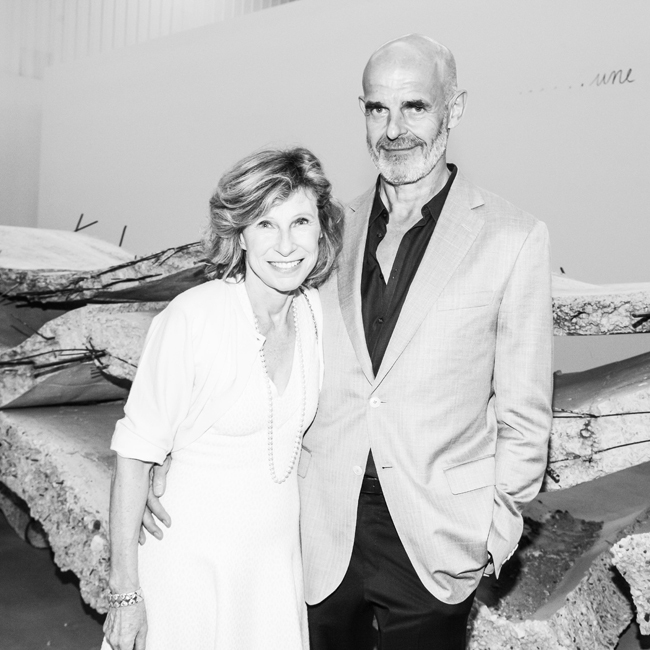 For a number of years running, Andrew and Christine Hall have been included in the Artnews.com annual list of the world’s top art collectors. Andrew approaches art collecting with the same passion and determination that are typical of his business style (of which his colleagues from the oil world say that if he ‘locks in on an idea, he’ll take it to the extreme’). One of the focal areas of Andrew and Christine Hall’s collection happens to be German post-war art. Anselm Kiefer, Georg Baselitz, Joseph Beuys – these are but a few of the names represented in their collection with a number of works. The couple visited Riga in mid-June to attend the opening of the ‘Elective Affinities’ exhibition at the Arsenāls Exhibition Hall (part of the Latvian National Museum of Art). Open through 21 August 2016, the show, dedicated to German art from the 1960s to the present, features a number of works from the Hall and Hall Art Foundation collections (alongside pieces from several other large private collections of German art). We met to talk at the café of their Old Town hotel and spoke about the reasons why Andrew had become interested specifically in German contemporary art and whether any parallels could be drawn between the art market and the securities and oil drilling market. Initially a dialogue with Andrew Hall, the conversation was later joined by his wife Christine. We set up the foundation about ten years ago specifically to make available works from our collection so they could be seen by the public, either in museums around the world, and also in spaces that we’ve built, that we operate, and which are open to the public. Is this collection the result of many years of acquiring works? Well, we’ve been buying art for forever, but we only became really serious collectors maybe 15 years ago. And that was when were no longer just buying things to put on the walls of our homes. But buying things just because we wanted to own them – because we thought they were important. And at that point, I guess, there was maybe an idea to build up a collection that would be worth showing to other people. What kind of art do you find important? Of course, importance is like beauty – it is in the eye of the beholder. But we have a particular focus on certain artists, and we try and collect the artists that interest us in depth. We’re not just buying one work by this guy, and one work by that guy. We try and buy a lot of work by artists that we find interesting, and that means that we can do whole shows that focus on a particular artist. Who those artists are – they can run the gamut. I guess we have a particular interest in German artists, especially German painters of the post-war period. But we also have a lot of work by American artists, so it’s hard to say whether there is a particular focus. Certainly, painters feature prominently in the collection, but we have a lot of photographic work, and sculpture as well. I would say we try not to get too caught up in fads. A lot of so-called collecting goes on today which is: some hot artist this year, and he’s forgotten the next year. We try to not get involved in that sort of thing. We tend to collect more established artists, who have some sort of record of showing in museums over a period of time. Where did you start? Who were the first artists that interested you? I’m not sure that’s actually so relevant to the collection today. I mean, who we were buying 30 or 40 years ago is not as important as who we have focused upon in the last 15 years. I mentioned these Germans, but in particular, artists like Georg Baselitz, Anselm Kiefer, and Joseph Beuys, and some of their contemporaries. 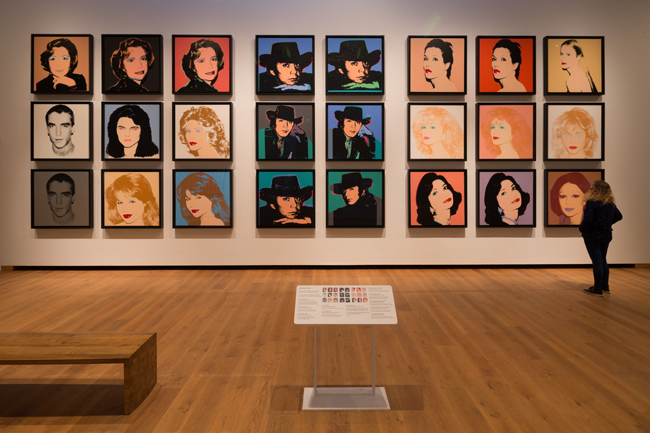 In terms of American artists, there’s Andy Warhol – we have a large collection of his work. Those are some examples. Do you have a friendship with Georg Baselitz? Yes, we’ve certainly gotten to know Georg. We’ve known him for about a dozen years. We spent a bit of time together when we first started coming to Germany. We always make a point of seeing him; we last saw him in England a couple of months ago when he had a show open there. We know quite a few of the artists we collect. It’s tricky, though; I’m not sure it always works out that if you like the artist’s work, you’re going to like the artist himself. Friendship is a strange thing. Is it because the art can be more interesting than the artist himself? Sometimes it’s better not to know the artist. I’m not sure you can generalize, really. There are certain artists we collect who we’ve come to know quite well, and there are others that we collect but who we don’t know at all. Baselitz we know, Kiefer we know... Julian Schnabel we know very well. It was Baselitz’s studio and home for 30 years. They call it a castle, but it was really a monastery originally. We just finished renovating it, and we’re planning to install it with parts of our collection. We’re a little bit on hold at the moment because of new legislation that the German Cultural Ministry has introduced, which makes it problematic bringing art into Germany. So, we’re waiting to get some resolution on that. Could you give little bit more deatials on that? The Federal German Cultural Ministry has introduced legislation that would mean any artwork that comes into Germany can be deemed to be part of the German cultural heritage, and they won’t then let you re-export it. Most European countries have similar legislation, but they also have quite precise rules as to how the legislation is enforced. But in Germany they haven’t, and it’s all very vague and ambiguous. It means, potentially, that any work that comes into Germany, you won’t be able to re-export it. 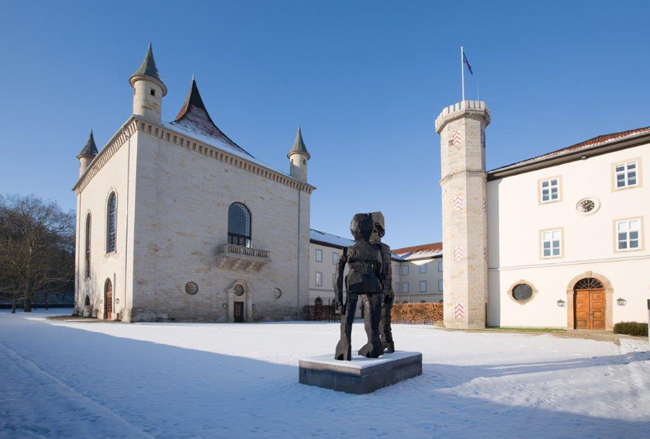 Because we have such a significant collection, particularly of German art, there is a very real risk that they would say that this is part of the German heritage, and we wouldn’t be allowed to re-export it – which would be disastrous. So, right now we’re waiting to see how this all will resolve. We’re trying to talk with the Ministry to get some sort of resolution. We’ve spoken to very many lawyers, but of course, you get as many opinions as you have lawyers. It’s a bit of a mess, and it’s caused a lot of concern among German collectors, obviously. A lot of them have already moved their collections out of Germany and into Switzerland, for example. So it’s having the precise opposite effect of what was intended. It’s something we’ve had to deal with; it’s a necessity. If you want to operate a foundation and run a public museum, you have to comply with certain rules and regulations. Tax issues and all these things… Because we’re American, and we’re doing this in Germany, it makes it doubly complicated. Why this interest especially in German art, in German painting? It’s hard to say exactly, but partly I think it’s by accident. I think Germany plays a very important part in art history, and I think there’s a very direct link to a lot of what’s happening in contemporary art. It follows a trajectory that goes through Germany. And I think post-war German art is particularly interesting – the country basically destroyed itself in the War, and I think for a period of time, it turned it’s back on that part of history. And then artists like Beuys, like Baselitz, like Kiefer, Richter – they sort of forced the country to confront its recent history via the medium of art. That’s an interesting phenomenon. And I guess, being English, I grew up in the aftermath of the War, so Germany had a kind of strange interest for me – because they were “the enemy”, so to speak. What you’re familiar with, which is your own culture, maybe doesn’t seem as interesting. 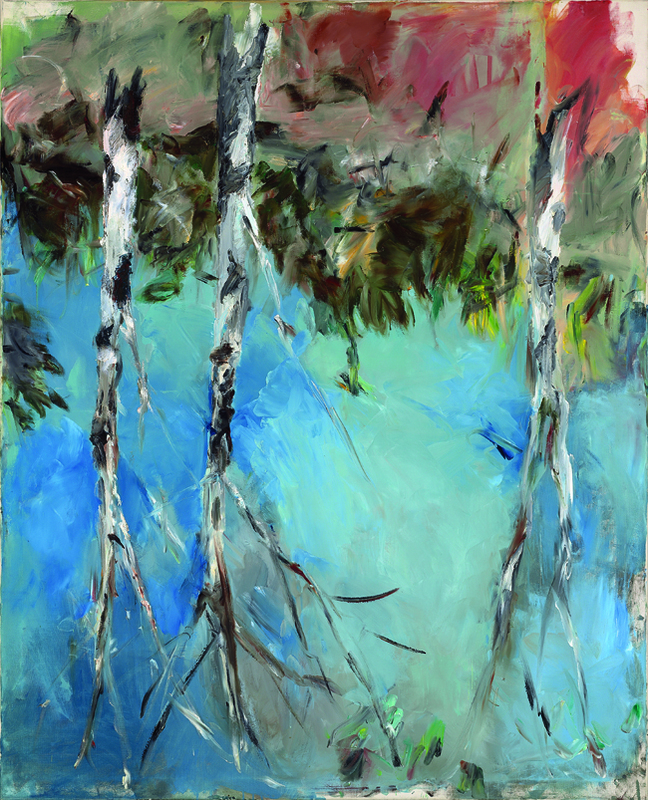 German post-war art, especially from the 1980s and 90s, is greatly focused on painting. Yes, that’s true. But I think it was before the 80s – that’s how they like to interpret it in America, because that’s when a lot of these artists came to prominence there. But in Germany, Richter and Baselitz were doing, perhaps, their most interesting work in the 60s. People are more familiar with the later work because these artists (Baselitz, Kiefer) represented Germany at the 1982 Venice Biennale, and which is when the Americans really first became aware of them; but c’mon, they had been producing stuff for twenty years by then. It did have something to do with a renewed interest in painting that was occurring in America in the 80s. By the 70s, it had all but died out. No one was painting; everyone was into conceptual art, land art and such. There wasn’t anyone really painting; well, they were, but no one was paying any attention. The 80s saw a change in that. The fact that these Germans had suddenly appeared on the scene, they got a lot of attention, too. So, there is the museum in Germany, but actually the largest center of your foundation is in the United States, in Vermont? Actually, the space in Germany is going to be much larger than what we have in Vermont. The space we run in Vermont is relatively small. We also run a space not far from Vermont, in Western Massachusetts. That’s a slightly different situation, however, because there we’re collaborating with the Massachusetts Museum of Contemporary Art, which is actually the largest museum of contemporary art in North America. They operate in an old industrial complex, and we renovated one of the buildings in that complex and we run it as a museum within a museum. They really run it for us; we paid for it. We installed it with art, and they manage it. We also collaborate with various museums in America and elsewhere – projects and exhibitions in which we may even lend all of the work in the exhibition. We just did one in England, at the Ashmolean Museum in Oxford, featuring Andy Warhol. 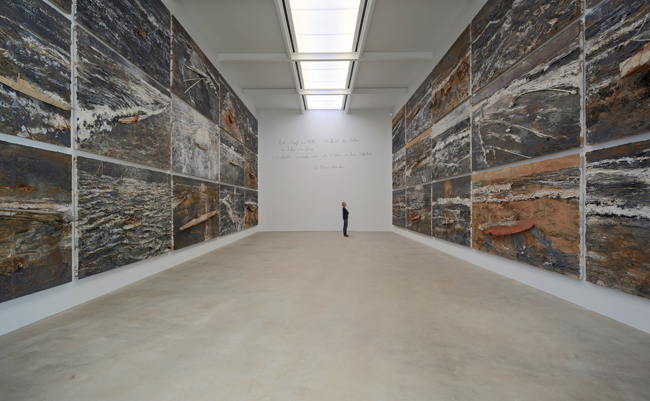 We’re going to be doing one with a museum in Fort Lauderdale, Florida, in November of this year, with works by Anselm Kiefer. For this exhibition here, in Riga, we’ve lent 14 works. The Foundation makes these sorts of things possible. If you’re going to lend works, it has to be organized; we had our collection manager come out and help with the installation and things like that. Which works have you lent to the exhibition in Riga? 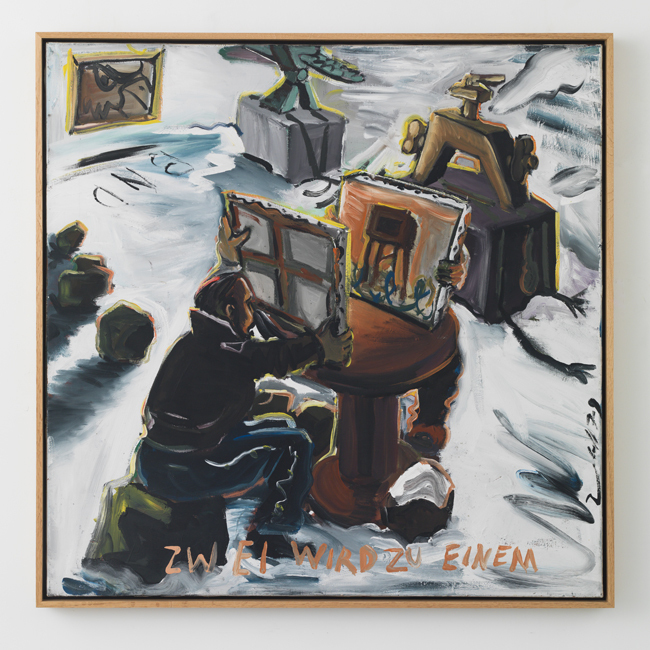 Here in Riga, we’ve lent two Baselitz paintings, seven works by Joseph Beuys, two works by Jörg Immendorf, two works by A. R. Penck, and a Sigmar Polke painting. If you look at the labels, you’ll see Hall Collection or Hall Art Foundation. They’ve set it up so that Baselitz is together with Beuys, so that whole room is pretty much work from our collection. Do you also have works of art at home? We do. We live with some of our collection. It’s funny – people like other collectors and museum curators call and ask if they can come and visit us to see our collection, and we say, yes, you can come and visit us, but you’ll only see a very small part of the collection. To see the collection in whole, it’s just not possible. A lot of it, at any one time, has to be in storage. Which brings us back where we began: that’s why we started the Foundation – because it was stupid to have work in a warehouse somewhere where no one can see it. The Foundation was set up so that we could get this stuff out there so people could see it. Christine: Don’t we lend out about a hundred works every year, more or less? Andrew: I think it’s more than that, actually. Some years it’s been several hundred. 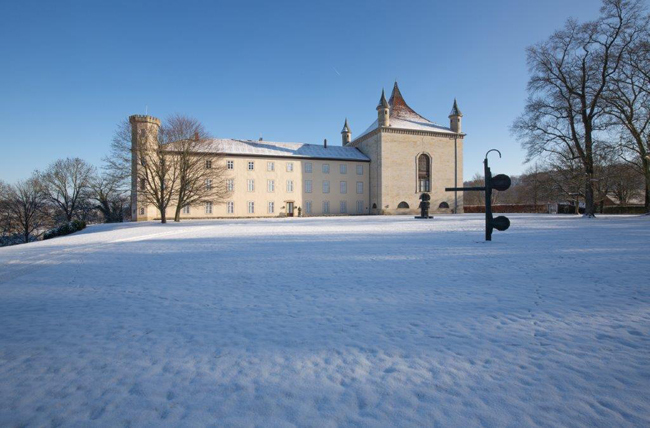 This year, because of the Warhol and Kiefer shows, it’s probably going to be around 400 works of art that we lend out to public museums in different parts of the world. I see that the Foundation also produces quite a lot of publications. Yes, we’ve made probably about a dozen books. We published one about the Warhol exhibition that we just had in Oxford. And I think we’re going to be doing one about the Kiefer exhibition that will open later this year. We maybe do one or two books a year. We normally get a well-known writer to write one of the essays, maybe two. The first book we did was for Julian Schnabel, about ten years ago; we had two major essays written for that. These days, everything is on the internet and the computer, so books are... In the art world, it’s a bit different, because they document things. The one they produced for this exhibition here is very nice. It’s a very nice catalog, actually. Does art inspire you in your everyday life? You are in a business that requires a lot of intellectual energy. Andrew: Yes, at least I have to work to pay for it. That’s the connection, really [laughs]. We really enjoy being with the art; it is a luxury, a pleasure, a privilege to live with good works of art. I enjoy coming home when I’ve finished working – some people turn on the television, but I stare at screens all day, so when I come home, I just sit and look at a piece of art. I find that very pleasurable. We’re fortunate in that we have more than one home, so when we move from one place to another, it’s like reconnecting with old friends. When you haven’t seen a painting or sculpture for a while, you reconnect with it. It’s like meeting an old friend again. Maybe you see it slightly differently; you see something new about it. Like seeing the works here [in Riga] – we’ve seen them before, but here they are in a different context; and when in juxtaposition with other works of art, you see them in a different light. Also, when you see them with other people, they may point out something that you hadn’t noticed before; so there’s always something to be discovered. When choosing which works to acquire, do you consult with experts? No; a lot of collectors have advisers, but foolishly or not, we haven’t really done that. We’ve just been guided by our own interests and judgement. We read quite a lot – magazines, books; and we talk to a lot of people – other collectors, art dealers, curators. We’ve actually become quite good friends with a lot of museum directors and curators, and also artists. Often, the best people to talk to about artists one should be looking at, are other artists. They generally have a very good eye. We’ve been recommended to go in certain directions by listening to what some of the artists who we collect say we should check out; we’ve ended up buying some really good work that way. When you have interest in a certain artist, do you look at his or her works on the internet, or do you like to see the works in person? I think you have to see them in reality. Just seeing a .jpg or an image on the internet is a little tricky. Once you know the artist’s work, then I think it’s OK. Let’s say Baselitz. We’re intimately familiar with his work, so when he does a new body of work, we might buy it just from seeing a picture on the internet, or if someone sends me an email. Actually, at his most recent show, we had put a couple of paintings on reserve, but I still wanted to see them in the flesh before committing. That’s why we went to the opening of his last show in London. I’m not saying we never buy things without seeing them in the flesh, but we prefer to. Do you check to see if the values of your pieces change? You know, I used to do that, and I still look at the auction results, I guess, but not fanatically. I used to follow it like the stock market, just because I found it interesting. But I find it less interesting now. You can’t ignore what the market is doing; it’s hard not to be aware of that because it’s become such a phenomenon. And journalists love to write about that. When we had our exhibition at Oxford, the BBC came and interviewed me, and they actually put this on the main news that evening, which is kind of amazing, really. The man who interviewed me did so for about 20 minutes, in front of the camera, but of course it all got edited down to about two minutes. We talked about Andy Warhol, why he was important, why I liked his works, and so on and so on, and at some point the guy asks me what the value of the works is. I said I really don’t discuss that, but when they edited it down to the two minutes, 75% of it was about the value of the work. Christine: One of the works was a dollar sign, so of course, that was the one they featured on television. Andrew: I guess for the general public, it makes for something that they can relate to. To say that this is a great piece of art – OK, you tell me that, and up to a point I believe you. But here’s a painting that just sold for a hundred million dollars – that’s what gets people’s attention. Whether or not it’s worth a hundred million is another question, of course. But unfortunately, these days there is a lot of emphasis on that aspect of art. And there are a lot of so-called collectors who buy art as a store of value, as an alternative investment, or as a way to make money. Obviously, I don’t feel that they’re wasting money. I’m not going to buy something without having some sort of sense about its worth; I don’t want to be paying twice the amount I could get from another dealer. You have to keep the dealers honest. You must obviously have a sense of what the value of these things are on the market, but that’s not why we’re collecting – so that we can say at the end of the year: the collection has appreciated x amount. We buy things because they fill a gap in the collection, or it’s some new artist that we’ve just discovered and it’s very interesting, and this should be the direction that we go in. A lot of people buy art because someone’s told them that it will be worth a lot more money in five years’ time. I just find that not very interesting. Being a professional in the stock market, can you make any parallels between the stock market and the art market? Like with all markets, there’s a lot of speculation. It’s true that art, ultimately, has no intrinsic value; whereas if you buy a stock or a bond, it does have an intrinsic value, which is the dividend or the interest that the bond pays. A painting or a work of art doesn’t pay dividends, and it doesn’t pay interest. Ultimately, it’s worth what the next person is prepared to pay for it. And that could be anything, really. If you look over the history of art, there have been enormous changes in fashion, and an artist that, a hundred years ago, everyone thought was wonderful and important, has just been forgotten. Similarly, artists that had been forgotten, have become very sought-after. You look at an artist like Caravaggio – when he was alive, and immediately after his death, he was one of the most sought-after artists of his day. And then for hundreds of years, his work was sort of forgotten. It’s only in the last less-than-a-hundred years that suddenly he has become viewed as one of the great masters. As I said, art doesn’t have intrinsic value, whereas financial assets do, but often times, the price of a stock or a commodity or a bond can become detached from its underlying value, and that’s just because every market has some emotional component to it. Like the story about the Dutch tulip bulbs: there was a mania to buy tulip bulbs, and so the pricing of them went much higher than should be rational. And you can certainly say that about parts of today’s art market – maybe the whole art market. Five years ago, I thought this art market is crazy – where does it stop? You do see big corrections where certain artists, especially younger artists – their prices just get out of touch with reality. If you come back to what I was saying earlier, we tend to focus on more established artists and those that have a fairly long museum record. When you really get down to it, there aren’t so many artists that fall into that category, and then when you look around the world, it seems as if there’s an enormous growing interest from the public, especially in contemporary art, more recent art. Look at the Tate Gallery, which has just opened a new wing: ten or fifteen years ago, the Tate was having just a few hundred thousand visitors a year; now they have – I’ don’t know – ten million visitors a year. You can’t get in the place because there are so many people wanting to see it. More peripheral places, like China – every city in China wants to have a major art museum. The Middle East – Abu Dhabi and Qatar, Brazil… I think there’s probably still a lot of demand, and there is a finite amount of work by established artists, so I somehow doubt that the price of Richters – they’ve gone up a lot in the past twenty years, and maybe they’ve stopped going up, but I’m not sure they’re going to collapse to zero, either. It is interesting, the market aspect of art, but I have that in my daily job – so I don’t need that. I’m much more interested in the aesthetic aspects of collecting. I think you’re right; that’s certainly the way I view it and my relationship to it. It’s not for me to judge how other people approach this. I think the spiritual aspect, like being in a church, is a good analogy. But unfortunately, as I said, in some museums, it’s hard to have that experience – their very popularity makes them anything but a spiritual place. Funnily enough, sometimes I tell people that one of the most spiritual experiences I ever had was confronting a work of art, and that was in Marfa, Texas, which is where The Chinati Foundation is. 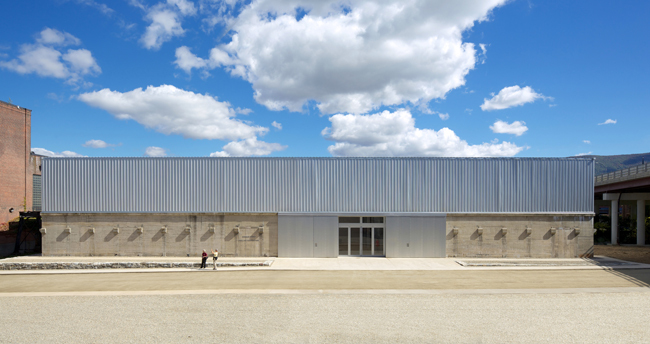 It was founded forty years ago by Donald Judd and Heiner Friedrich, who had been a German art dealer – they took over this old prisoner-of-war camp in Texas, in literally the middle of nowhere. 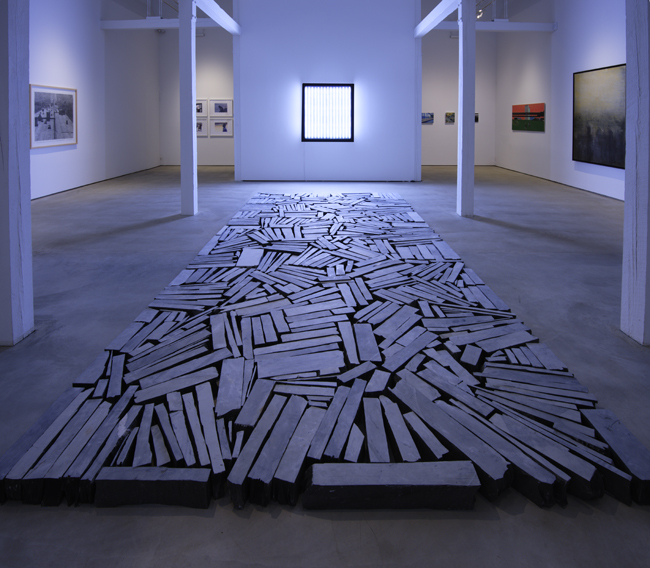 It now is a permanent installation of the work of Donald Judd, Dan Flavin, and other artists. It’s an amazing place. One of the spaces there is full of these Judd sculptures – and that is like a religious experience. I think it’s a little harder to have a religious experience going into the Museum of Modern Art because there are too many people there. I kind of hate it. That’s another aspect of the art world that I don’t really like – museums get judged, largely, on how many visitors they have, and that becomes the metric that determines their success. I think that’s kind of really sad. Christine: But it has to be financed, and governments are giving less and less money... So that is where this race for the number of viewers comes from. Let us hope then that Hall Art Foundation in its future exhibitions, both permanent and temporary, will manage to find the right balance between the quality of the viewers’ experience and the quantity of those to whom it will be accessible. And thanks for the works on view this summer in Riga!